The gender pay gap isn’t just about fairness and legal compliance. Addressing gender pay equity is also an issue of profitability. No wonder it has become a matter of board-level concern. According to the Peterson Institute for International Economics’ recent study of 21,980 companies in 91 countries, the presence of more female leaders in top positions of corporate management correlates with increased profitability. The gender pay gap has become a rallying cry among shareholder groups, in the media and politics. According to one widely quoted statistic from the Institute for Women’s Policy Research (IWPR): “In 2015, female full-time workers made only 79 cents for every dollar earned by men, a gender wage gap of 21 percent.” That quote has been repeated, reprinted and retweeted countless times, but how accurate is it? While there is some consensus that a gender pay gap exists, what is it really? Equally important, what are the causes, and what can organisations to do to ensure that individuals are paid what they are worth, regardless of gender? Korn Ferry set out to create a more accurate view of what the gender pay gap actually is. We had one advantage at the outset, one lacking in other analyses: We were able to control for job level—the biggest driver of pay. Our pay database holds compensation data for more than 20 million employees in more than 110 countries and across 25,000 organizations, making it the largest and the most comprehensive such database in the world. In addition, for every country for which we have the granular data (in this case for 33 countries), we were able to compare pay for men and women at the same job level; at the same job level and in the same company; and at the same job level, in the same company and in the same function. By isolating the main factors that influence pay—job level, company and function—we found that the actual gender pay gap looks far different from the image broadcast in the media. In fact, the deeper we drilled into the data, the smaller the pay gap became. And when we compared like with like, it became so small as to virtually disappear. So where does this “79 cents for every dollar” come from? It’s all about averages across sectors and top to bottom in functions—a simple average of all male salaries versus all female salaries. Men dominate in highly paid functions and sectors, while women cluster in lower-paid functions and sectors. And even in the industries where women dominate, men hold the vast majority of management and board roles. These imbalances mean that if you compare the global average pay for men and women, there is a large gap: around 20% in 2014, dropping to 15% when you look at median instead of average figures (according to the International Labor Organization and the Organisation for Economic Co-operation and Development, respectively). That is where the much-quoted gender pay gap figure comes from. 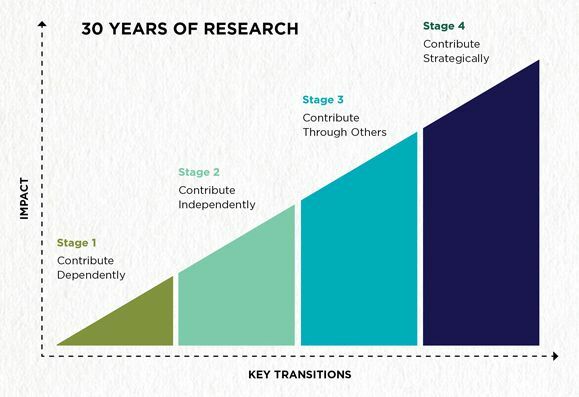 Consider these figures and our apples-to-apples comparison within our framework, called the “The Four Stages of Contribution” model. As one moves from stage to stage, compensation increases accordingly. According to our research, women as a group get stuck in their career development at Stage 2—that’s where the bottleneck is and the cause of the gender pay gap. You’re new to the job or in the workforce so you need the help of others. You’ve gained technical expertise and can get results with less supervision. You’re building your credibility and networks. You’re a manager, team leader or mentor and use what you know to stimulate others. You have a broad business perspective. You’re involved in setting the organisation’s direction, spotting and developing business opportunities and mentoring potential leaders. Achieving equality for women in the workplace confers many advantages on an organisation, most of which are by now well-known. As the Peterson Institute research strongly suggests, such diversity boosts corporate profitability. Korn Ferry research further indicates that companies in the top quartile for gender diversity are 15% more likely to have financial returns above the median for their respective national industry. In fact, going from 0% to 30% women in corporate leadership is associated with a 15% increase in profitability. Greater gender diversity is also associated with more innovative work cultures, the ability to better connect with customers and a better perceived brand image. Rethink how you recruit, develop, promote and reward women. Look at organisation design. Examine job specs, career ladders and typical paths up and through. Explore how design can help to solve known issues. Look at job designs. How well are roles defined, and what’s the pay at each level? Are people clear about what they need to do to move up? Determine how these processes affect recruiting. Do newcomers, especially men who negotiate aggressively, get paid more? Strive to eliminate bias in recruitment processes. Check in regularly to make sure hiring managers are using objective selection criteria and “name-blind” processes, that diverse teams interview candidates, and that psychometric tests measure potential and soft skills. Revisit job requirements to ensure relevancy. Approach capable internal candidates first. Consider in-house talent before advertising a job externally. Forensically examine your organisation’s reward strategy. Be particularly aware of how that strategy links pay to performance. What are bonuses and salary increases based on, and can line managers make subjective pay decisions? Get women into the pipeline—and keep them there. Use succession planning to identify and develop future leaders. Develop a high-potentials program, with clear and objective criteria, to guide leaders and line managers and to offer opportunities to fast-track their development. Champion female role models. Seek women leaders who are relatable and realistic in work/life balance. Ensure diversity programs have visible support from both men and women. Provide opportunities for mentoring and sponsoring to both men and women. Look at your organization’s mobility strategy. Consider alternatives to overseas requirements for developing leaders to gain a global perspective without uprooting their families. Hunt out and challenge assumptions about fit. This is especially important when it comes to leadership styles. Avoid stereotypes about women as leaders that might lead to overlooking them for leadership roles. Broaden use of onboarding programs. Include both new employees and those who have been on leave. Provide a variety of career options. Individual career aspirations and paths vary, so provide both upwardly mobile opportunities as well as lateral moves. Not every woman aspires to a general management leadership role. Finally, in addition to specific recruitment, compensation and management development systems, boards must foster a culture that promotes gender equality if companies are to knock down the impediments to women ascending to leadership positions. Management should do its homework to find solutions that stick. That means tapping women in the organisation itself to determine what benefits they would find most valuable, as well as keeping up-to-date on research to learn about innovative practices at other companies. Like virtually every other important initiative, recruiting and retaining diverse leadership talent starts at the top. If there is a commitment to making this change, the CEO should regularly share with the organisation not just targets and progress, but also a reminder of the case for change and why it is important to the organisation. Positive word spreads quickly when an organisation offers a welcome and supportive environment for women who want to grow and contribute as leaders.